I just added Gary Scott's site to the blogroll on the right. Gary used to cover City Hall for the Pasadena Star-News and now is a producer at KCRW Radio. Since media relations is a big part of what I do in my professional life, I have been attuned to the turn of events in the world of daily newspapers, due in large part to the changing way in which people get their news. I was in elite company on Saturday afternoon at the San Gabriel Valley Bloggers Picnic, minus the trees and the park and the picnic tables and the ants and the flies and the sun and the dogs. It was at the Aztec Hotel in Monrovia, which I have passed many times over the years but had never had an occasion to visit. We were in a private banquet room of sorts, with three or four tables pushed together, and there was plenty of good food and company. 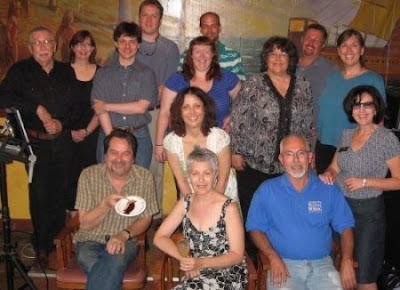 I finally met so many of my fellow bloggers whose sites I have admired over the short time since I learned what a blog is, including Dianne, Petrea, Ben, Irina, Ed, Susan, Kelly, Billy, Frank and many others. I promised Aaron Proctor a very special Christmas present this year: a bar of soap to wash his mouth out with. I was in San Diego from Saturday evening to Monday morning (I'm usually down there on weekends these days, looking after my dad). I always take the 15 freeway down because it's so easy and usually wide open. Here it was this morning on the way back, about 8 a.m. somewhere between Escondido and Temecula. Way quicker and prettier than the 5, and it leads directly to the 210. When I got to my office at City Hall and opened my window shade, I was struck by how fortunate I am to be on the second floor on the Garfield side, with beautiful magnolia trees outside in full bloom. I have been moderating "City Beat" on KPAS for many years, along with Barry Gordon who moderates every other program. We did a taping today at the KPAS studio, which is at the Hens Teeth Square complex at the southwest corner of Los Robles and Woodbury. Here's part of the control room just before taping began. Here we are on the set. I'm getting my microphone attached by Oliver Brown, our engineer. That's Mayor Bogaard on the left, of course. On the right are James Macpherson, publisher of the web-based publication Pasadena Now; and Dean Lee, reporter with Mountain Views Observer. Producer Stuart Johnson and floor manager Davide Collioni, who also operated one of the cameras, were standing by. So as not to slight the rest of our exceptional crew, Lilia Gaspar handled CG in the control room, Mike Bingley and Jimmy Aquino operated the other two cameras in the studio, and Kevin Brechner is our director extraordinaire. After the taping, Kevin wanted me to review a segment of the program before I left the studio to come back to City Hall. "City Beat" is the only Pasadena TV program where local issues are discussed by elected officials and journalists. Today we talked about the recent Sister Cities trip to Järvenpää, Finland, and Ludwigshafen, Germany; the MTA Board's decision to delay funding for the Gold Line extension to the east San Gabriel Valley; a possible PUSD bond measure for capital projects that, if approved by the Board of Education, would be on the November ballot; water conservation; and the Fourth of July. The program repeats daily -- see the programming schedule at the KPAS link above -- and you can also see it via streaming video at that same link. I met for lunch today with Cheryl Friedling, deputy city manager of public affairs for the City of Beverly Hills, and Cheryl Burnett, public relations manager for that city. We decided to meet somewhat in the middle and chose Chinatown. Many people think the Plum Tree Inn on Hill Street has closed, but it hasn't -- it has moved just a block over to Broadway, to bigger digs. Good friends of mine, Sheri Benninghoven and Scott Summerfield of SAE Communications, were hired to create a communications plan for the City of Beverly Hills. Cheryl F. and her staff are implementing it. I met Cheryl F. once before, when she was a finalist candidate and I sat on one of the interview panels. That was nearly a year ago and I'm really pleased that it worked out. There was a shindig this evening at the Pasadena Convention Center construction site to celebrate the "Topping Off." Invited guests, including city officials, board members of Pasadena Center Operating Company, the construction team and community leaders, signed the final steel girder, which will become part of the permanent structure. 1. The U.S. is crazy with cell phones. In Järvenpää, I didn’t hear or see a single one. Ever. In Ludwigshafen I saw a couple of them from time to time but never heard one ringing -- I think people always had them on vibrate. I didn’t realize just now obtrusive cell phones are until I stopped hearing them. So put your cell phone on vibrate from time to time or let the voice mail pick it up. It’s amazing how much more aware of your surroundings you can be without this ever-present, permeating distraction. 2. We have the luxury in the U.S. of being able to debate climate change (it’s exaggerated; it’s not taken seriously enough; it’s caused by humans; it’s caused by nature. Yadda, yadda, yadda.) Cross-country skiing is the big tourist industry in and around Järvenpää, but that industry is all dried up now because it hasn’t snowed there for two years. Helsinki Harbor freezes over every day in winter, and huge ships break it up so commerce can continue. This past winter, for the first time in recorded history, the harbor did not freeze. The icebreaking ships sat idle. 3. Converting liters to gallons and Euros to U.S. dollars, gas in Järvenpää is about $7 per gallon. 4. In Finland, as in most other Scandinavian countries, cradle-to-grave social welfare for all citizens, provided by the government, is a fact of life. From health care to a college education, it’s paid for 100%. Or, as we were told over and over again, it’s free. But it’s not. Finland has a flat 30% income tax across the board, sales tax is 22% and there are countless other taxes that are through the roof. And with that, this Queen of the Blogosphere bids a final farewell to our wonderful sister cities and our fantastic hosts. What’s the topic for tomorrow? You’ll have to tune in to find out! Do You Take This Mayor. . .
Do you take this mayor to be your lawfully jet-lagged traveling companion? Yes! 'Til death do we part. Cities from left to right are Lorient, France; Pasadena, California, USA; Ludwigshafen, Germany; Antwerp, Belgium; and Dessau, Germany. Dessau was selected when that city was part of East Germany and therefore behind the Berlin Wall. Since reunification of Germany, Dessau and Ludwigshafen decided to continue their relationship even though they're now in the same country. Good idea. Tomorrow I'll have a couple of final observations on our Sister Cities trip, and then I'll move on to other topics. After an 11-hour flight from Frankfurt to LAX, Mayor Bogaard, Judy Kent and I were back on U.S. soil. Most of the others in the delegation stayed another day or two in Ludwigshafen, and then many were going to take a tour of Prague and some other cities. Using the sole computer at each of the hotels in Järvenpää and Ludwigshafen was a real challenge. Other guests wanted to use them as well, so I was always in a hurry, which made it tougher because it took a long time to upload photos to the blog; or I used the computers very late at night (1 a.m. or so) or very early in the morning (4:30 or 5 a.m.). So here are a few additional photos that will give you a fuller flavor of our adventures. Helsinki Harbor: If it walks like a cruise ship and talks like a cruise ship, it must be a cruise ship, right? Wrong. It's the overnight ferry to Stockholm. The students at Järvenpään Lukio, the high school, publish a magazine that is quite impressive. These two vans look similar. Both transport people around town. One's a Mercedes and one's a VW. There's a gigantic difference in price. Pasadena's General Plan goal of getting around town without a car may well have been inspired by Järvenpää. Here there are big incentives for not driving a car -- there are only a few parking lots, and those only hold a handful of cars each; plus the cost to park is huge -- the average is about $20 an hour. So people rely on bicycles, walking, buses and light rail. Remember the photo of all those bikes at the light rail station? That was right next to the parking lot, which I regret I didn't photograph. It has spaces for about 20 cars max. That lot is not reserved only for light-rail riders; it also serves the Rivoli Hotel and an adjacent shopping area. Bianca (second from right) grew up in Ludwigshafen and her parents still live there. A few years ago she did a professional internship at Abbott Labs in South Pasadena. She and her significant other, Markus, who is next to her in the photo, now run a cafe at a ski resort in Austria. They presented us with gifts from their cafe. Heidelberg walkway: Barrel-vaulted ceiling with cast-stone flowers. Pasadena City Hall: Barrel-vaulted ceiling with cast-stone flowers. The architects Bakewell and Brown of San Francisco had many inspirations for the design of Pasadena City Hall, including classic European architecture. That's Heidelberg Castle, looking down on the city. The imposing complex of buildings was constructed on the orders of the Prince Electors and the work took more than two centuries to complete. The tower to the left is undergoing renovation. View from the castle: The foundation stone for the gothic-style Church of the Holy Spirit was laid in 1398. The church is the dominant feature in Heidelberg's central market area. We began the day with Ludwigshafen's Sister Cities Festival, where each of the cities and respective consulates had information booths. There was live entertainment and refreshments. Here's a folk dancing group from Ludwigshafen's sister city of Lorient in the Brittany region of France. The musicians in the background are playing binioú bagpipes, smaller and shriller versions of their Scottish cousins. Then many people in our delegation took a 20-minute train ride to Heidelberg. By way of comparison, Ludwigshafen, was almost completely destroyed by Allied bombing during World War II, and only 20% of the buildings survived. Heidelberg, however, was the headquarters of the Allies, and its architecture is completely intact. It is among the most important collections of classic German architecture anywhere in this country. Heidelberg University and the town's commercial districts are on one side of the Neckar River, in the shadow of a historic castle; the other side of the river is dotted with beautiful homes. Those are vinyards clinging to the side of the hill above. Most tour guides carry umbrellas or signs; we were pleasantly surprised to see our tour guide holding up a rose in honor of Pasadena! Here's everybody in the Pasadena Sister Cities delegation who made the trip to Heidelberg (the obligatory Star-News shot!). 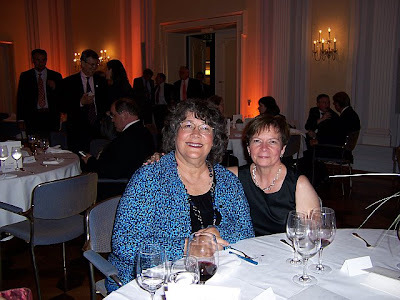 Judy and I had to catch the train back to Ludwigshafen before the rest of the group because we were expected at the final mayors' dinner and had to rush. This final dinner was much more casual than the other affairs and was a nice opportunity to relax. All of the mayors exchanged souvenirs with their respective communities' symbols or emblems. Here's the Vice Mayor of Antwerp, Belgium, wearing a Pasadena rose while Mayor Bogaard sports an official Antwerp tie (those are "A"s on the tie). Then everybody in the group exchanged handshakes and hugs, and promised to keep in touch with each other. The mayors committed to working together in the future to discuss shared issues. After dinner, Mayor Bogaard attended a concert by what apparently is one of the hottest bands in Europe right now -- Reamonn. Judy and I had not heard of them and were pretty beat after hiking around Heidelberg in the 90° heat, so she and I beat it back to the hotel. And now I'm cutting this a little short so I can get upstairs, change clothes and prepare for the long plane trip back to LAX. Judy and Mayor Bogaard will be my traveling companions again. I'll do some wrap-up after I get home. Ludwigshafen: The Celebrations Just Keep On Comin'. Judy and I met for breakfast in the hotel, where a Chinese man sitting by himself at an adjacent table was reading a red-covered book. Soon Judy and I became distracted by his twitching, which became increasingly dramatic. Finally he began hitting himself in the head with his book. We're not doctors (though we play them on TV), but our expert diagnosis was Tourette's Syndrome. In the continuing Ludwigshafen sister cities celebration, about 200 people gathered at the headquarters of the Deutsche Staatsphilharmonie (German Philharmonic Orchestra) for a formal commemoration and reaffirmation of this city's "twinning" relationships. Dr. Lohse wore her official "ceremonial mayor's chain" (her description when I asked her), a traditional here in Europe. My new goal is to create a ceremonial chain for Mayor Bogaard. All creative concepts will be gratefully accepted and carefully considered! A woodwinds ensemble from Musikschule Ludwigshafen am Rhein (City of Ludwigshafen Music School). . .
. . .and a saxophone quartet from a music school in Dessau entertained us. Don't let their age fool you -- these kids are world-class musicians. Then Dr. Lohse introduced each of the mayors, who presented brief remarks about their respective cities' relationships with Ludwigshafen. "A relationship of 60 years is a wonderful accomplishment! Everyone realizes, I am sure, that the support that was offered by Pasadena in 1948 took place several years before President Eisenhower announced the Sister Cities program. The contact resulted from the friendly thoughts of persons in Pasadena that efforts should be made at the local level to overcome the damage of World War II. 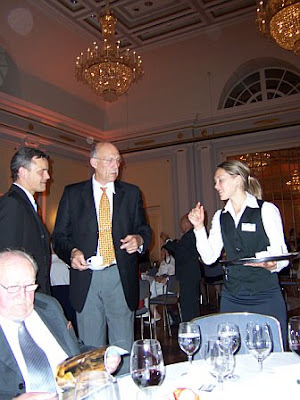 I am proud to say that first gesture has led to a wonderful relationship involving generations of persons in the two cities.. . .We look forward to continuing this relationship and involving more persons in both Ludwigshafen and Pasadena in the cultural, educational and social excahnges that are involved. On this 60th anniversary, it is appropriate not only for us to look to what has taken place, but what is possible in the future." Of course, I had to tease Mayor Bogaard afterward about his prolific use of the word "persons" during his speech. One of the rules in Aaron Proctor's City Council Drinking Game requires that somebody must take a drink every time Bogaard utters that word. People (persons?) all over Pasadena were falling down drunk in the streets at that very moment. There was a luncheon on a lower floor of the Staatphilharmonie, but Mayor Bogaard, Judy and I decided to pass on it and head instead to a Lutheran catheral a couple of blocks away that was nearly completely destroyed during the war. The only thing left standing is the clock tower, spire and part of the facade. It is now the site of a little restaurant and bar with plenty of outside seating. We decided it is the absolutely best and most practical example of adaptive reuse in the entire universe! This Russian Orthodox church is on the Mannheim side of the river. There are three levels on this boat, and Judy and I quickly discovered where the bar and the band were located -- lower level. Some people liked the band, others not so much. I liked it. We stayed downstairs for some time because the sky was so dark it looked like it might rain. But eventually the sun came out and we headed up to the top level. Here's the Mannheim car ferry making its way across. After the boat returned, Judy and I headed to a beer garden (are you beginning to detect a theme here?) where Dr. Lohse hosted dinner for the mayors and their immediate staffs. Mayor Bogaard woke up from his nap just in time to join us! We had great fun, and it was a good opportunity to get to know the other mayors and their entourages. Mayor Bogaard, Judy and I sat next to the group from Lorient. We feasted on bratwurst, sauerkraut, mashed potatoes, beer and wine, all brought by servers in appropriate beer-garden costumes. Marcel joined us! What a nice surprise. He had been running around all day, preparing all the details for the opening night of a major annual street festival. He told us he had to eat quickly, apologizing that he couldn't chat it up with us. Of course, Judy and I seized the opportunity to create idle gossip about him. "What? He didn't! He wouldn't! Not the Marcel I know!" Poor guy struggled to keep his composure and remain completely professional. . .
. . .but we finally broke him up. By the way, Marcel lives a few miles outside of Ludwigshafen, in a house that his family has owned for nearly 200 years. We headed to the opening concert of the annual Ludwigshafener Stadtfest, a big outdoor festival that takes place in the streets of this city over the period of several nights. This opening event was in a large plaza where hundreds and hundreds of locals gathered. Thankfully we had VIP seating up front. The Deutsche Staatsphilharmonie Rheinland-Phalz (the regional state orchestra based in Ludwigshafen) performed a program of operatic overtures, and a guest soprano and bass performed arias and duets. Stunning. But before the performance began, Dr. Lohse opened the program with an introduction of the mayors onstage. The crowd went wild!!! After the concert ended, Mayor Lohse led the VIPs on a quick walk through several blocks to a BASF-sponsored champagne celebration (the orchestra conductor joined the party as well). The entertainment was an American group that performed country western music! We joked repeatedly (alcohol had nothing to do with the repetition) that we came all the way from the U.S. to hear cowboy music! BASF is the largest chemical corporation in the world, and it is based in Ludwigshafen. Ever wonder what makes your Levi's blue? Some kind of dye with chemicals manufactured by BASF. From plastics to laundry detergent, BASF has a hand in the chemical makeup. The Rhine River used to be among the most polluted in Europe, but BASF stepped up to the plate several years ago, imposing strict environmental controls on itself. Now the Rhine is blue and clean again, and the fish are back. End of sponsored commercial. Judy and I struck up a conversation with the worldwide facilities director for BASF. Nice guy. Judy asked him how many people report to him directly. I don't recall the exact response, but it was in the thousands. Back at our hotel, I settled in for the night only to be awakened an hour or so later by what sounded like riots in the street. I couldn't figure out what was happening -- horns honking, people yelling, firecrackers going off, etc. I kept waiting for the sound of sirens that would signal the arrival of police to break up the madness, but that never happened. It continued all night long. This morning at 5 a.m., when I came downstairs to use this computer, I asked the night desk clerk what all the hubbub was about. Turns out Turkey won a soccer game last night. The revelry continued to the nightclub next door, where until just a few minutes ago the music was deafening in that Euro/Techno-style. Lots of tour buses are lined up outside right now, presumably to take the drunken revelers outta here. OK, I'm heading upstairs to get ready for a train trip to Heidelburg. We are Ludwigshafen! We flew from Helsinki to Frankfurt and waited for transportation that was to arrive from the mayor's office. Suddenly there was a blur of activity. It was Marcel Jurkat, who was among our Ludwigshafen guests in Pasadena last month. 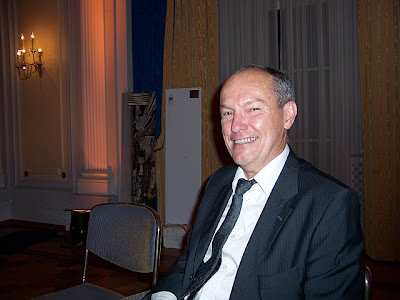 Marcel works in the office of the mayor of Ludwigshafen and is the chief of protocol and town twinning. (Town twinning is the European term equivalent to sister cities). He seems to do it all, and with great efficiency. He greeted everybody quickly, pointed to Mayor Bogaard, Judy Kent, Karin Warner and me, respectively, and said, "Come with me." To the rest of our group he said, "A bus will be here shortly to pick you up." We got into two Mercedes Benzes parked nearby, the drivers fired them up and then away we drove to Ludwigshafen at speeds that I clocked at 200 kilometers per hour (124 miles per hour) on the speedometer (I was in the front passenger seat). The Autobahn's country of origin has the need for speed! Ever since I came to work for the City of Pasadena and learned about the Sister City program, I have known that Ludwigshafen is situated on the Rhine River, immediately across from Mannheim. So when we began to see less countryside and more civilization, I kept my eyes peeled for a big river. And there it was, in all its glory. Crossing over it gave me goosebumps. We arrived at our hotel and about an hour later were whisked away again by Marcel, this time on foot, and this time to an outdoor cafe in a beautiful park right outside the hotel door, and this time just Mayor Bogaard, Judy and I. When we had finished with our lunch of salads and Pellegrino, we walked a couple of blocks to the Ludwigshafen Rathaus, which is their City Hall. It's a modern, 16-story building, all of which contains city offices with the exception of the first floor, and that's a modern shopping mall with lots of upscale shops. We took the elevator to not quite the top floor and the office of Dr. Eva Lohse, whose title is Oberburgermeisterin (loosely translated, that's Lord High Mayor). When Dr. Lohse led the Ludwigshafen delegation to Pasadena a couple of months ago, we were all impressed by her combination of charm and savvy. When Marcel entered her office to announce us (we waited in the hallway), she let out an excited shriek and gave us all big hugs and sincere expressions of welcome. She pointed to the conference table in her office, where scads of index cards were laid out in rows, each with a name on it, and explained that at that very moment she and two of her assistants had been making decisions for seating at a concert that is on the itinerary for our visit here. The view from Dr. Lohse's office is spectacular. The Rhine River cuts across the middle of the photo and Mannheim is on the other side of the river. I moved toward the window to snap a couple of photos, and Marcel announced that he would take us to an even better vantage point. We took the elevator as high as it would go, went up what seemed like 47 flights of stairs, and emerged on the roof, with sweeping 360° views -- a benefit I took full advantage of. Then it was back downstairs to one of the lower floors, which has the obligatory city offices and a back door that leads out to lots and lots of roof gardens. Marcel explained that the Marriage Bureau is on this floor, and many couples exchange vows in this setting. After a couple of hours of much needed rest back at the hotel, we got gussied up and went to a beautiful building called Das Gesellschaftshaus, which is owned by BASF and used for social engagements. Locals refer to it as the Casino, although there's no gambling there. We joined about 150 other people at an outdoor reception followed by a beautiful formal dinner, entertainment and presentations in a room that reminded me of the Gold Room at the Pasadena Civic Auditorium. Like Pasadena, Ludwigshafen has several sister cities, and delegations were in attendance from all of them. Dr. Lohse gave a brief background and acknowledged the mayors of each of the cities. then at various intervals she called them to the podium to say a few words about their relationships with Ludwigshafen (these were presented in languages ranging from German to French to English). There was a lovely exchange of diplomatic gifts, and to top it all off, Germany won 3-2 against Portugal in the first of four games of the European soccer playoffs. OK, it's 3:36 a.m. and I'm officially getting punchy. But I don't want to sign off for the night without mentioning the three gentlemen who sat closest to me during dinner, and with whom I enjoyed sparkling conversation. Mr. Winfried Ringwald is president of the Ludwigshafen Sports Federation, which oversees everything from soccer to basketball to bowling, and he is president of the Ludwigshafen Rowing Club. He was on the German rowing team in the 1972 Olympics. He's standing in the center in the photo below. Jean-Paul Solaro is vice mayor of the City of Lorient, France, one of Ludwigshafen's sister cities (pronounced Lor-ee-AWN). His actual title is vice mayor for economics and international affairs. Wolfgang van Vliet is Ludwigshafen's vice mayor for sports, social affairs and immigration. That's him below with his hands folded. We lost him early to the soccer game! I also had a nice visit with Jo Ellen Powell, the U.S. consul general stationed in Frankfurt, who is passionate about education and doing everything she can to rally German educators around the concept of helping to improve the lives and hopes of immigrant Muslim teens so they will be able to aspire for higher goals than cleaning houses and going on the public dole. Heading Off to Sister Cities!